As many poll-watchers know, this year's race for U.S. President is one of the closest in elections history. Today's primary races have the ability to change the course for both the Democratic and the Republican nominees. To make it easier to track all the action, we've decided to mash up all of the voting information that's out there to create one mapping platform for elections results -- all the way down to the precinct level. Every state's voting data has been integrated into one comprehensive map. Included in the map are results for all states that have already held their elections, as well as information about the primaries to come. 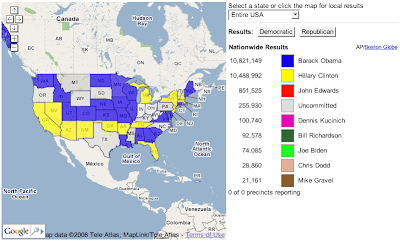 To use the map, select a state and view results by party, by candidate, or even by precinct. Tonight, we will be publishing live results from Texas, Ohio, Rhode Island and Vermont, complete with total delegate counts by candidate so that you will be first to know the outcome of such important results. Rather watch the map from your own website? Embed this map into any page on the web and keep tabs on the outcome.